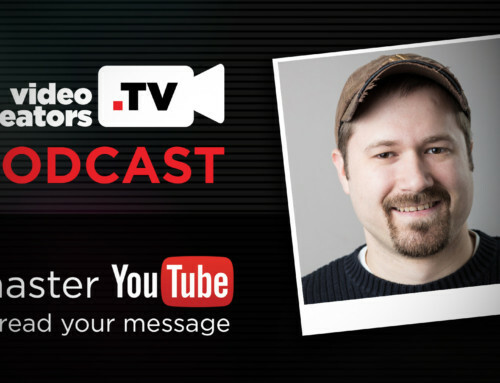 If you are a YouTube vlogger, I want to share with you guys some highly practical tips and advice for how you can grow your audience and your YouTube channel in the vlogging niche here on YouTube. YumYucky wrote and asked this. Do you currently have or can you do a “best practices for vloggers” video? I don’t currently have a video like that, but I am making one for you right now. Number one, I think you really have to know what the main value is that you are bringing to your audience. And that’s true for any YouTube channel, not just vloggers, but especially true for vloggers, because a lot of vloggers think, oh, if I just sit down and talk to the camera or if I just show them around my day, you know, then that’s going to be awesome for people to want to see. But maybe you’re experiencing that not as many people think this is awesome to see as you might hope. And that is because people watch YouTube videos because they are valuable to them in some way, not because, unfortunately, they care about you or your audience so much. It’s like right now, you’re watching this video primarily because you’re hoping to get some information from me that’ll be beneficial to you. So you’re hoping to get value from me right now. And that’s OK. Like, we can be friends. But you do have to understand that other people watch your videos for the same reason. Now, when you’re vlogging, the value often that you’re giving is a relational value, which can be a very strong, powerful value that someone can grow to love and trust and like you and respect you. But just like any relationship, they take time to build to get to that level. So if you are a vlogging channel, I often recommend try to think of a different value that you can give that would hook someone into wanting to keep getting that value from you, but through the process of getting the value that they want for themselves, they start to like you, they start to love you, they start to trust you. And the relationship value can grow then over time. The key to doing that is to make sure that every video you do delivers that same hook value, which maybe for you is going to be about beauty stuff or maybe it’s going to be about family stuff or text stuff, or whatever the case may be. Whatever the value is, you’ve got to offer that consistently in every video so they do keep coming back. And then the relational value with you can build and grow over time. Number two, kind of going along with that, just like any relationship is that it has to be consistent, right? So you have to publish new videos to your channel regularly, consistently, and predictably so that your viewers know when to come back and expect new content from you. Otherwise, the relationship that you’re trying to build with them is just kind of hit or miss. And any time they watch one of your videos, it’s more likely an accident rather than them intentionally seeking you out. Number three, a lot of the top YouTube vloggers are also really good storytellers. They know how to craft a story to start it with a good hook and to lead to like a climax of some sort of conflict or some sort of issue that then has like a short period of resolution on the other end. That’s kind of the normal story arc that you will see in pretty much any TV show or movie that you would watch. So make sure you are doing your best to tell really good, engaging stories. One of the best that I found is Olan Rogers. I’ll put a link to his channel below. He just sits in front of the camera and tells really good stories. So pay attention to what he does, to his facial expressions, to how he develops the picture in your mind that you are visiting while he’s talking, and the conflict that he’s leading towards, and then the short amount of resolution after that. Watch him, pay attention, and I know you’ll learn a lot about storytelling just from watching his videos. Number four, and this is a really big mistake that I see a lot of vloggers making, is that they sit down, they tell us about something more than they actually show us something. This is especially true if you’re like a family vlogger or something. Don’t just like come and sit on the couch, “hey guys, here’s what I did today. Oh, it was awesome.” For some of you, that might be totally appropriate, especially depending on what you’re doing. But when possible, I feel at least me personally, I always appreciate it when it feels like the creator is including me in the experience by bringing me along like I’m hanging out with them and sharing that experience with them, rather than me just coming to their house and being like, “hey, give me a report about what you did today.” I know that’s not always possible and it’s not even always appropriate. But when you can do it, do your best to make the viewer feel like they are included in the story, not just like a spectator or just listening to you report about it. And number five, I think it’s really important for you to watch a lot of other vloggers and just kind of pay attention to what they do and how they do it. I will link up to some of my favorite family vloggers down below if you kind of want to watch some of those. My own channel’s down there too. My wife and I, actually we started vlogging in 2006 before it was even called vlogging. And now we’ve been– over 1,000 videos had led to our engagement, our marriage, our honey– well, the honeymoon got taken down because of copyrighted music, but– kids. And we’ve been doing it ever since then, so we’ve learned a lot along the way. So if you want to check out our channel, I’m not saying we’re great or awesome or anything, but maybe you can learn a thing or two. But definitely there’s a lot of links down there to some of my favorite. And the reason why I recommend that you guys watch a lot of those vloggers is because it’s said that the best authors also read a lot of books. And so it’s like the more you read, the better writer you become. I think the same is true for YouTube. The more YouTube videos you watch, the better YouTuber you become. I know a lot of you guys here have watched a ton of YouTube. You’re also vloggers. You’ve learned a lot. So definitely share in the comments below what advice and tips you have for someone who is a vlogging channel on YouTube. I would love to learn from you guys myself. And if you are someone who’s trying to learn and grow as a vlogger on YouTube, read the comments the community is leaving here. You will learn so much from them, like I do on every video. Also below, you’ll find a link to my ebook. It’s called 30 Days to a Better YouTube Channel. If you want to learn how to make your YouTube channel as subscribable as possible and as sticky, so that once people find you, they subscribe and become a part of your vibrant community, that book will teach you all about how to do that. It’s linked up below, so go check that out.